Branch District Library was created on May 30, 1991, and our first meeting took place the next day, June 1, 1991. On this page you'll find minutes from then to the present. Meeting minutes will be published here as soon as they are approved. Draft minutes are available by request. Starting with September 2012, board packets are available to read online, too. We will sometimes redact people's contact information from these Internet-accessible Board packets, such as with patron comment cards to us. 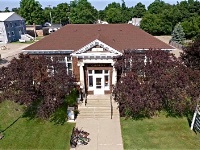 However, full, complete, and un-redacted Board meeting packets are available for view by the public at the main library branch in Coldwater by request. Approved meeting minutes are never redacted. Our full Freedom of Information Act policy and procedures may be found here. June 2014 The June 2014 meeting was canceled due to lack of a quorum. June 2013 The June 2013 meeting was canceled due to lack of a quorum. August 2013 The August 2013 meeting was canceled due to lack of a quorum.